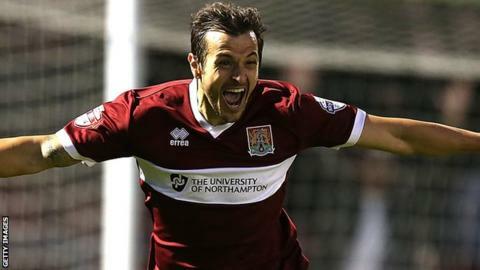 Northampton Town's Alex Nicholls says the pressure on him has lifted after scoring for the club for the first time in two years against AFC Wimbledon. The 26-year-old scored the second goal in a 2-0 win at Sixfields, where he badly broke his leg in 2012. Nicholls told BBC Radio Northampton: "The pressure I've been putting on myself to get that goal - it's gone. "The crowd have been with me all the way. It's nice to get that goal at home and repay those who supported me." It was not Nicholls' first goal since the incident against Port Vale, as he found the net on loan at Exeter earlier this season, but he says the goal for Northampton is a special one. "It's a massive moment for me," he said. "Luckily it went in - I don't remember too much after that. "The fans have been behind me all the way, and the staff, and they would've carried on if I hadn't scored for another five or six games. "I've had a couple of difficult weeks in front of goal but hopefully this'll be the start of a fruitful run for me. "It's been a tough time but I don't want to go through the rest of my career with people looking at me saying that's the lad who was out for two years with a badly broken leg. "I want to carry on my career and put all that behind me so when people ask me these questions about how I feel, I try to dismiss it a little bit."